To understand how we came to the current state of stagnation in international climate change negotiations, we need to return to the very beginning, and trace how the process and the roles of the various actors have evolved. An analysis of the geopolitical balance demonstrates that we need a paradigm shift away from neoliberalism and technical, top-down ‘solutions’ if we are to make the changes needed to tackle climate change. Rémi Beau: The Fifth Assessment Report of the IPCC has just been published. Can you remind us what science tells us about climate change and how the ‘climate alarm’ has developed? Amy Dahan: The first time the climate alarm was sounded was a long time ago. It became so loud that the IPCC was set up in 1988. The IPCC is unique as far as organisations go, but it was modelled after the monitoring mechanism for the ozone layer. In the 1980s heightened concern for the hole in the ozone layer led to the establishment of a scientific monitoring group. The issue is less of a concern today, but the group still exists precisely because the Montreal protocol (1987) led to a drastic reduction in chlorofluorocarbon emissions. The IPCC was set up in part because of the multilateral nature of the endeavour, founding it was quite complex, but a lot of stakeholders from a lot of different countries really wanted to better understand climate change related challenges. Basically the idea was to unite a group of scientific experts to elucidate some climate questions: the IPCC was born. The IPPC’s Fifth Assessment Report was recently published. The problem is simple: the situation is getting worse, much worse. Since 1870, we – all countries and regions combined – have emitted 550 gt of cumulated CO2. In 2013 alone, we emitted 9.9 gt of CO2 and this annual figure continues to increase! And this despite the fact that scientists agree that emission levels of around 800 gigatons of CO2 would mean an increase in the world’s average temperature of 2° C. Moreover, if we continue business as usual, rather than an average temperature increase of 2°C, we will experience an increase of 5° to 6° C with all of the consequences that follow. There has been much criticism of measuring anthropogenic climate change in this way. After all, what does global average temperature mean? What does it refer to precisely? Therein lies some of the fundamental aspects of climate change: most phenomena referred to as climate change related are abstract, global, and not directly perceptible. To boot, it is irreversible. It’s already happening even if we cannot feel it yet. For these reasons, climate change is hard to grasp, to understand, and it creates cognitive dissonance. Rémi Beau: Could you explain the so-called “Climate Regime” from its origins to its progression and implementation? And could you give us an overview of the approximately 20 years of climate change negotiations? Amy Dahan: The Framework Convention was established in 1992 at the Earth Summit in Rio. It was implemented in 1994 and a year later the first Conference of the Parties (COP) was held. Since then one is held every year. Just like with any multilateral undertaking, the process is very cumbersome. Over the course of the first decade, in the 1990s, the focus was on negotiating the Kyoto protocol. In the initial phase, the IPCC expert reports have been crucial. The scientific diagnosis of the danger of climate change served as a basis for the political process. In the first ten years, negotiations were essentially between developed countries (who wanted to do the bare minimum), and developing countries. North/South relations were extremely polarised. To Southern countries, climate change was the North’s problem. The North was the culprit, the North had to act. The majority of developing countries thought that climate change was a fabrication meant to stunt their development. To this point, scientists did a great job educating on climate change. One of the IPCC’s greatest achievements was convincing Southern countries that climate change did indeed exist and that it was a real threat. Environmental NGOs assisted in the effort and it was so successful that developing countries – notably the most vulnerable and poor – became active and instrumental in climate change action in the early 2000s. As Northern countries experience extreme climate events, the shift towards adaptation is happening there too. Countries in the North are resigned to the fact that the war must be waged on two fronts: reduction and adaptation. The geopolitical balance shifted around 2002 and the reason is twofold. First, because emerging countries are by definition emerging, which changes everything. Second, because previously reluctant developing countries began to take a more active role in the negotiations and they placed the potential losses and damages that they might incur as a result of climate change at the centre of the debate. On this subject, the IPCC’s Group 2, which handles issues related to the most vulnerable regions of the world and the impact of climate change, is gaining importance. Adaptation is also increasing in prominence, in addition to greenhouse gas emission related issues. As Northern countries experience extreme climate events, the shift towards adaptation is happening there too. Countries in the North are resigned to the fact that the war must be waged on two fronts: reduction and adaptation. The first decade of the 2000s was marked by the realisation that global warming is a reality and that climate change is here. This brings us to the 2010s. Currently the process is at a crucial point. First, to put it simply, since the Copenhagen conference, we have been at standstill in governance bodies. Now, I don’t want just the negative to come out of this brief overview. There is increasing awareness of the challenges of the multilateral approach and its corollaries: COPs, the emergence of alternative climate fora, i.e., fringe fora, etc. NGOs have had a big role to play in this. Second, negotiations seem to be stuck. Despite all of this, some countries have implemented policies on their own to reduce green house gas emissions. That means that some progress has been made, albeit not enough to fight climate deterioration. This does show that there is awareness of the problem. We can say that there is a veritable race between climate deterioration (that is moving much faster than we had initially believed) and local and national policies to slow it. International efforts are essentially absent. Rémi Beau: Could you explain the various groups of countries influencing the climate debate? Amy Dahan: Until recently, there were three big groups of countries weighing in on the climate negotiations: Europe, the United States and the G77. The G77, an extremely heterogeneous group, was initially made up of 77 countries and today has 132. It is currently referred to as the G77 + China. We can sum up their respective positions as follows. The European Union has long been proactive in its climate policy and has consistently advocated a very ambitious binding treaty. The United States has consistently protected its own interests (economic and energy-wise), stating that it will not sign any treaty unless all countries – especially China – are signatories. China, with the G77, has always emphasised the responsibility of Northern countries in causing climate change. Very early on, China became the spokesperson for developing countries, offering to defend the latter in all climate discussions. The depletion of the ozone layer was caused by pollution by chlorofluorocarbons. So, the solution came down to finding an alternative to chlorofluorocarbons. But obviously, climate change is completely different. This basic description becomes more complex as we look more closely at the disparate make-up of the G77. G77 countries have varying levels of development and extremely different interests. In fact, we can consider that there are subgroups within the larger group. The first subgroup is the BASIC (Brazil, South Africa, India, China) group, which unites the big emerging countries around a few common interests. These countries have developed so rapidly that they currently account for a significant share of today’s CO2 emissions. Nonetheless, the BASIC group continues to insist that the Northern countries do the heavy lifting. The second subgroup is made up of the least advanced countries along with the countries that are most vulnerable to the effects of global warming. They have progressively distanced themselves from the emerging countries by pointing out that the BASIC countries’ development is endangering them. This group includes the highly vulnerable small island states of Oceania and is known as AOSIS (Alliance of Small Island States). This division became so clear in Copenhagen that there was even talk of an effective split of the G77. Rémi Beau: In your opinion, how can we move beyond the standstill in international climate talks? Amy Dahan: What we really need is a paradigm shift. We cannot keep having international climate talks like we have until now. It’s a waste of time, we are not committing to anything. If we keep focusing solely on long-term objectives, or on whether or not international climate treaties should be binding, we will never actually tackle the problem. We should be asking ourselves some concrete questions and taking on material issues for which we must find solutions such as: how can we produce clean energy? What techniques can be used to reduce emissions? To sum up, we have to bring the territorial specificity and the material side back to the core of the debate. On this point, it is true that while the negotiation process remained firmly stuck in a sort of neo-liberal framework – while we waited for the markets to self-regulate and solve the climate problem – some countries realised the unsustainability of this and the need to re-evaluate the entire development model in place in Northern countries, and that has been replicated in other countries around the world. Developing countries and emerging countries realise that this development model is not viable, not only for the planet, but also for them. For example, in China, we’ve seen that because of the related problem of air pollution, climate related issues are beginning to be addressed, albeit too slowly. Some countries have adopted the “ecological modernisation” paradigm and are attempting to establish their leadership in the area. Germany is the most advanced example. Other examples, in another way, are South Korea, and especially China, which aims to produce and sell solar panels to the world. In this context, an international agreement on climate change must seek to free itself from the runaway economic competition amongst States that has done more harm than good. That is why it is crucial to move past the current standstill in international efforts to fight climate change. Rémi Beau: To overcome the current impasse, it is important to understand the causes. What are the main reasons for the lack of progress in negotiations? Amy Dahan: Historically, several rules have been identified as having derailed negotiations. Also, as I stated previously, some parts of the structure hampered the process as well. First, the way in which international efforts to tackle the hole in the ozone layer served as a model for climate change negotiations resulted in a misunderstanding of the issue. The depletion of the ozone layer was caused by pollution by chlorofluorocarbons. So, the solution came down to finding an alternative to chlorofluorocarbons. But obviously, climate change is completely different. CO2 is not a pollutant. It is a part of everything we do, it is a part of our life, and our physiological cycles. I believe that by attacking the problem from the outset as if it were a problem of global pollution, prevented us from fully comprehending the challenge. The second major cause of the impasse is the role that the United States has played. The US participated in the drafting of the Kyoto Protocol (which aimed to distribute the burden amongst the Northern countries), but never ratified it. As soon as there were enough signatories, the Protocol went into force in 2004: without the US. Yet, everyone keeps acting as if the US will one day ratify the protocol. It is almost as if we just keep waiting for them. The third cause – and I’d like to emphasise this point – is the neoliberal economic framework of the 1990s, according to which the market would work everything out! Regulation was out of the question, re-evaluating our production modes and energy models was unthinkable. Negotiations only dealt with the “end of the line” and never the source. The questioning surrounded the products and the pollution, but never how we produced. To sum up, we have to bring the territorial specificity and the material side back to the core of the debate. In this context, the negotiations focused on two questions: defining a timeline over the course of which long-term objectives would be met and the implementation of the CO2 exchange. Yet again, these two points turned out to be bitterly sterile. The timeline set objectives that were too far in the future and too abstract and the CO2 exchange doesn’t work. It hasn’t generated enough financial flow to support investment in “green technologies.” The price of carbon is too low to hope that it will “decarbonise” the economy. From this standpoint, the key element in the liberal approach to fighting climate change has been a failure. The world changed enormously in 20 years – globalisation of trade has accelerated, emerging countries have developed extremely rapidly, and the world’s energy landscape has been transformed. This all must be taken into account in efforts to move past the impasse. That’s why negotiations must be freed from the cumbersome process that slowed down negotiations. We must shift away from the “ Top-Down” paradigm that has prevailed until now and that was supported by long-term objectives and the CO2 exchange, and move towards a “Bottom-Up” approach based on material issues and the actual problems facing the various countries. On this issue, I believe that it will be crucial for the negotiations to recognise that States have different specific interests and that they will defend those interests in international climate change fora. Some of these interests run counter to efforts to fight global warming. It is not by ignoring this fact that we will be able to make progress in negotiations. On the contrary, the various geopolitical interests must be integrated into the negotiation process. At the same time – and this would be my last recommendation – to get out of this rut, we must unlock the climate issues, while clearly identifying the subjects that are specific to the climate regime. Internationally, climate change negotiations are too isolated from other multilateral processes. Every day, in the international arena, decisions are made that run contrary to the fight against climate change. This contradiction between the acceptance that the whole world must take part in climate change negotiations and the simultaneous cordoning off of climate change issues slows down the process and condemns it to a standstill. 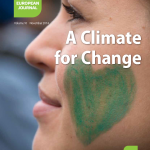 This is an extract from an interview with Amy Dahan and Stefan C. Aykut, conducted by Rémi Beau, that was originally published in French by the French Green foundation Fondation de l’Ecologie Politique on May 5, 2014, titled “L’Europe face au changement climatique”.